NOTE: The Three Stooges Trading Card series are being phased out ... if you missed out on the EIGHT series of Three Stooges you can message me and we might work something out. But basically, that ship has sailed. For weekly+ updates to current projects, offers, news and such visit us on FACEBOOK ... our page there is RRParks CARDS. Important! Prices below are for US orders only -- US orders are postpaid. If you are outside the US then please email me for a special invoice (postage varies depending on your location and I'll have to figure the cost for you based on total weight of your order). Below items are all currently available to order ... you'll find a specific listing and directly below the listing on the right hand side is a paypal checkout device. If you're going to order a bunch of stuff just drop me an email requesting a combined invoice and let me know where to email the invoice. Again, US orders are postpaid... international orders will require a special invoice. 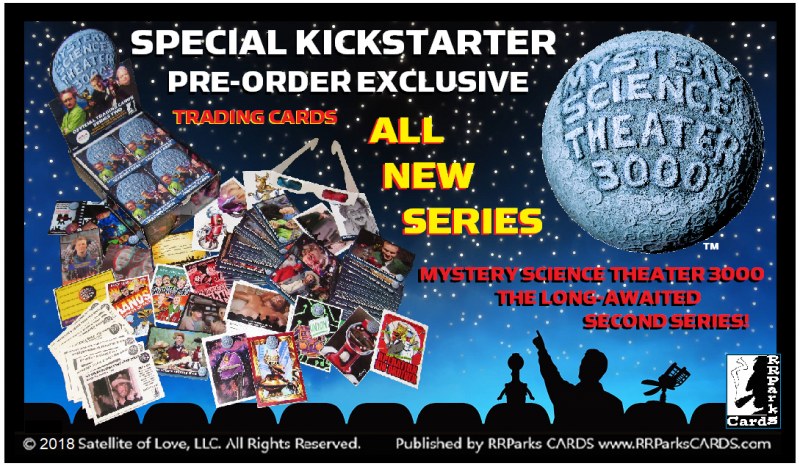 Mystery Science Theater 3000 Trading Cards Series Two. 40 10-card packs come housed in a full color pop-up display style box. Each box is guaranteed complete Invention Exchange, Experiment, 3D, Riff It and Vance/DVD Menu Art sets ... PLUS special subsets like KTMA, Retro Promos, Macarie Portrait limited edition and Sketch Card Gallery Promos ... with other chase and scarce cards like Glow in the Dark, Cell Cards, original art Sketch Cards and more. Each box has a box topper combo of 3D glasses and 1 limited production metal card. 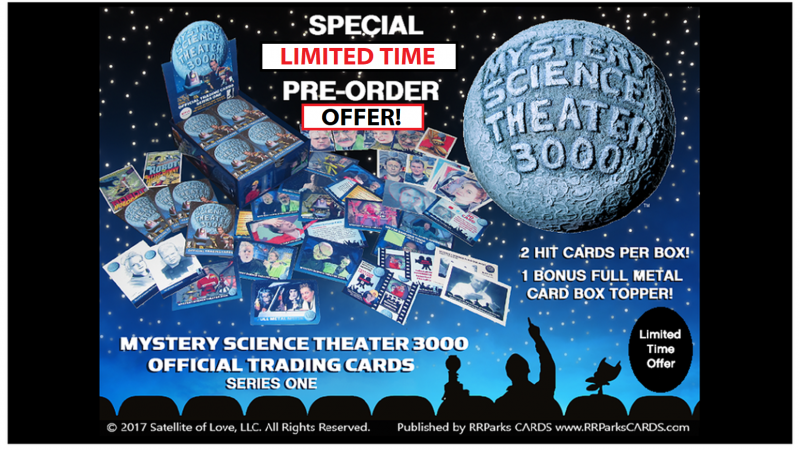 The MST3K Series Two box is the largest single series ever published by RRParks CARDS with 540 different cards to collect and boxes contain no duplicates! Biggest bang for the buck in the whole non-sport hobby! Plus I think we have the coolest boxes in fandom -- with a box that features 36 mini clipout cards (full color front and back) and a header card. Postpaid in the US ... international orders please message me for a special invoice to include shipping to your country. Limited to stock on hand. Took 30 years for this to happen... but it finally EXISTS! Mystery Science Theater 3000 Trading Cards Series One. 36 10-card packs come housed in a full color pop-up display style box. 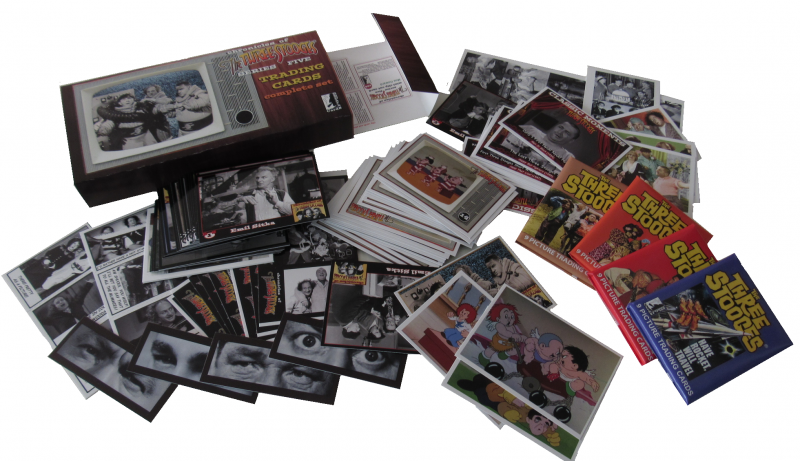 Each box is guaranteed a complete 104-card 'Invention Exchange' set, 50-card 'Experiment' set covering the first 3 years of the classic TV show, 29-card DVD Menu Art subset, 18-card Anaglyph 3D subset (with a free pair of 3D glasses in the box top) and a 36-card 'Riff It' Retro Stalgic subset. Look for special chase and hit cards (guaranteed TWO in each box) which can include a genuine original art sketch card, show-used costume prop card (2 different to chase! ), genuine printing plate card, Limited Edition Byron Winton art card, Faux Film Cell card and more. Each box also comes with a limited edition full metal box topper. 36 packs, 360 total cards -- and the retail box is produced 24pt full color inside and out with a bonus 33 mini clip-out cards. [postpaid in the US, international orders please message me for a special invoice to include shipping to your country]﻿ ...THIS CARD BOX IS AVAILABLE NOW (but don't wait too long... it is getting closer to being sold out! 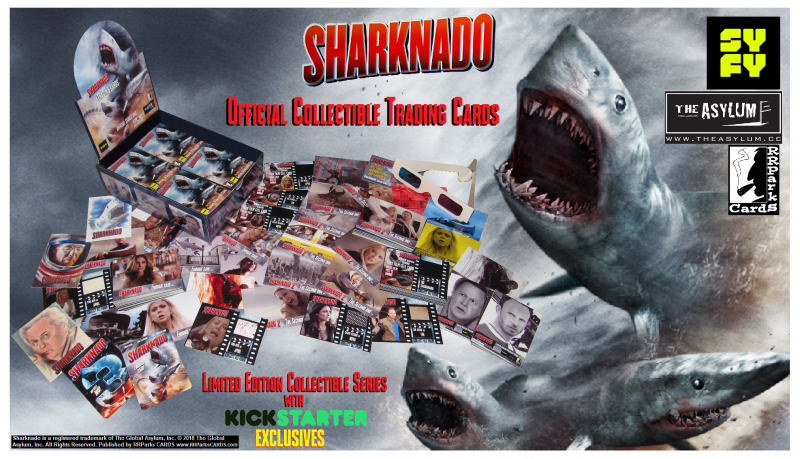 We've waited almost SIX YEARS for Sharknado Trading Cards and here they are! The series is in a retail style 'pack box' and features 36 10-card packs all inside a heavy duty full color inside-and-out box with 33 mini clipout cards. Each box is guaranteed to include a complete 90-card SHARKNADO base set, a complete 90-card SHARKNADO 2 base set, a complete SHARKNADO 'Bloody Subset' special sub-series and 18 different 3D Anaglyph cards with a free pair of 3D glasses inside the box. Special hit and chase cards include limited edition Macarie portrait puzzle-back cards, actor subset, Faux Film Cell cards, genuine movie-used costume/prop relic cards, printing plates, sketch cards and more. With a limited edition Full Metal box topper card by Faerie Metal (but of COURSE!). All for only $85 postpaid in the US. You can order the pair of sets right now as PRE ORDER. They will ship first week of October. You can view the 'As seen on TV' video on my facebook page RRPARKS CARDS. 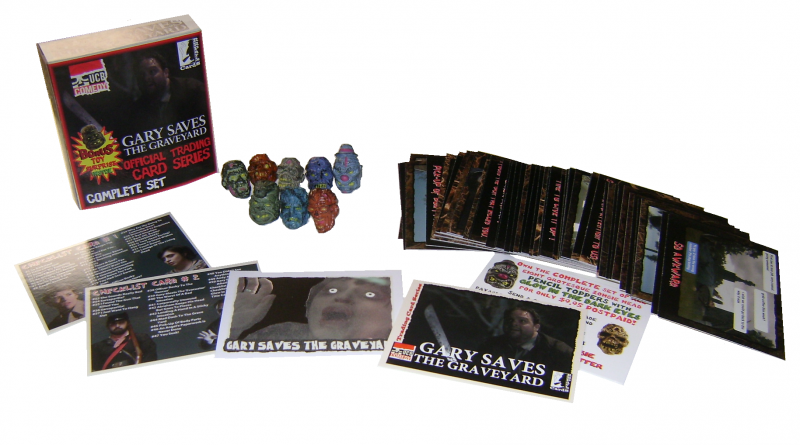 Gary Saves the Graveyard is the first trading card set based on a horror web series! The UCB Comedy 5-episode web series has become a cult classic ~~ Directed by Todd Bieber and starring Jim Santangeli, Tallie Medel, Nate Dern, Dawn Luebbe, Shannon O'Neill, Tessa Greenberg and Timmy Wood. Story involves a well-meaning lunkhead who has obtained a job as a cemetery caretaker... a job description of which he didn't listen to when he was hired because it involves taking care of over 200 ghosts and zombies that roam the grounds at night. The Card series is 50 base cards telling the entire story along with exclusive interviews with the director Todd Bieber and lead actor Jim Santangeli (along with additional interviews from Nate Dern and Tessa Greenberg). The language is a little 'mature' and so this set has an M rating. 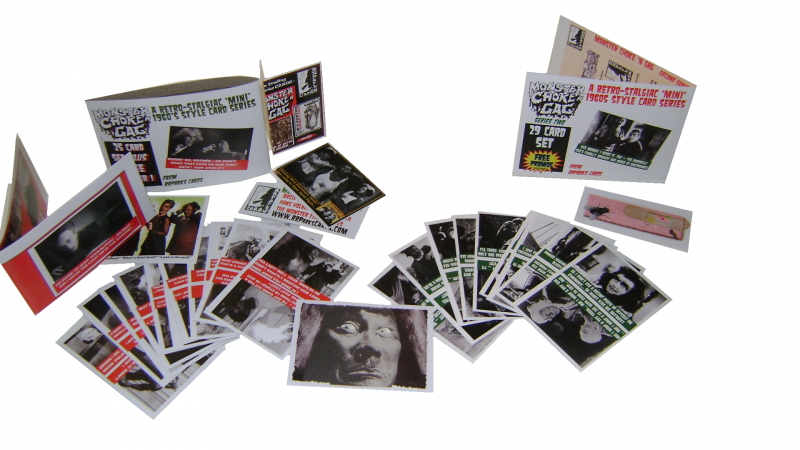 In addition to the 50 card base set are 2 checklist cards, title card, Glow In The Dark card, and ONE of 8 different 'zombie head toy surprises' in the slipcase style box. The first 450 sets ALSO include one of 8 different genuine autograph cards from the cast and crew (none of that 'signed sticker' nonsense -- cards are hand signed). 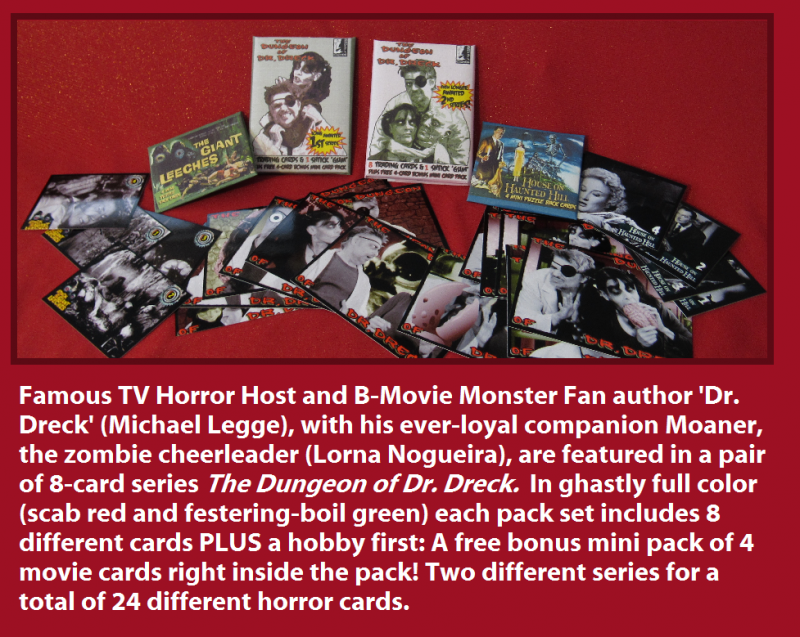 Monster Choke n Gag Series I and II and III package deal! 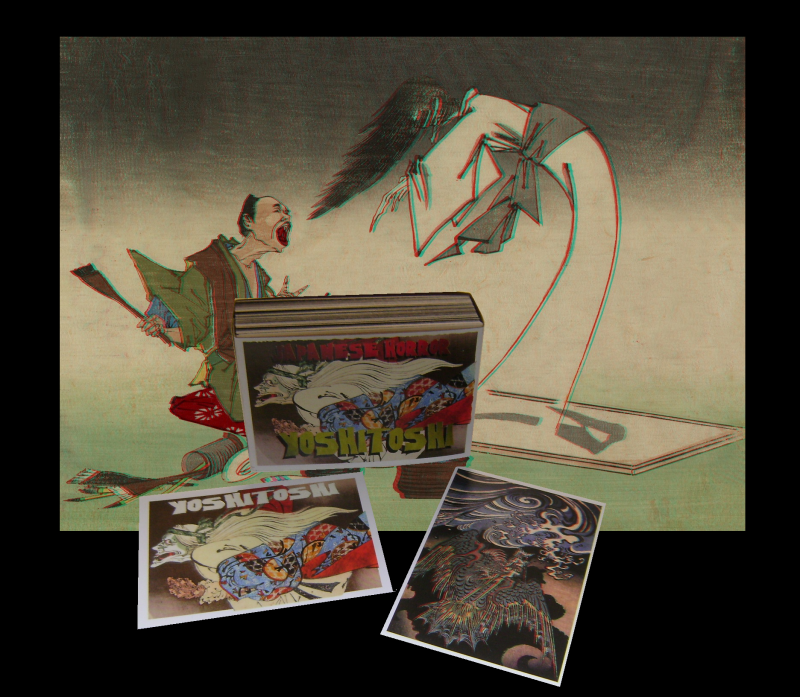 Japanese Horror Yoshitoshi in Full Color 3D! This is one BEAUTIFUL and gruesome and creepy card series ... with artwork created by Yoshitoshi, Kuniyoshi and others over 100 years ago! However, through the magic and genius of Andrew Cambalik (the wizard of anaglyphs and design) these classic Japanese horror images are now in 3D!!! 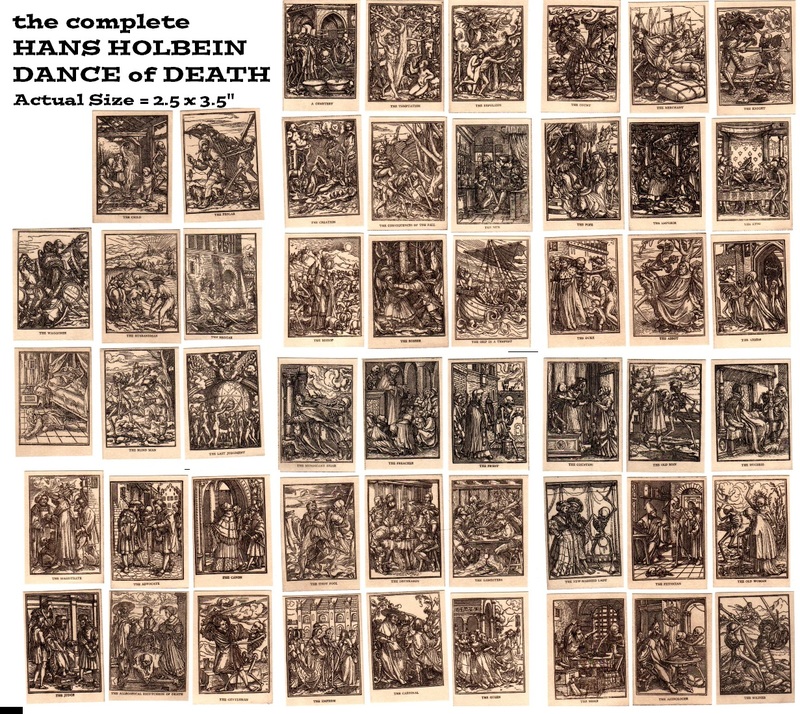 Chronicles of the Grim Reaper ~ 74 card 'wide view' RETRO STALGIC style trading card series featuring the beautiful artwork of Tom Rowlandson in full color ... and on the back, a brief history of everyone's favorite bone head with illustrations by G. Dore, A. Durer, Leonardo Da Vinci, and other artists of the last 500 years. 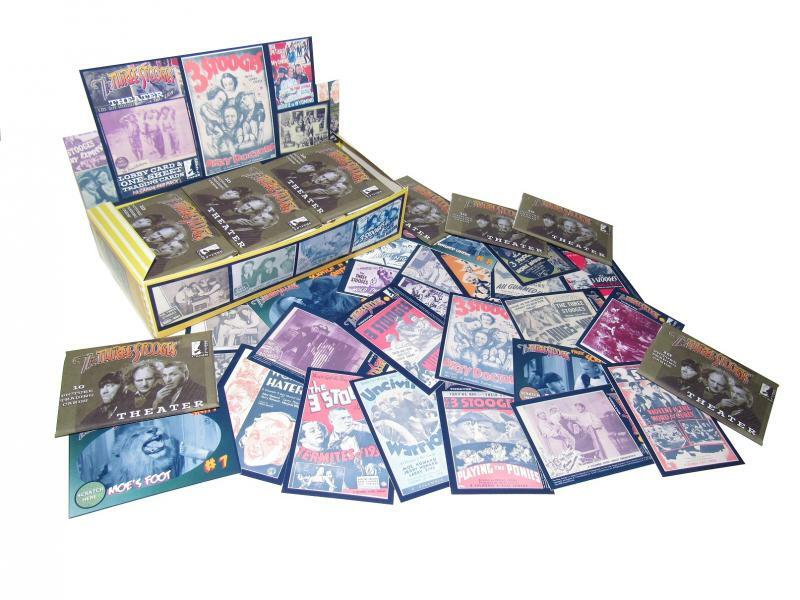 The complete set of 74 different cards comes housed in a slip-sleeve style box with bonus cards. [postpaid in the US, international orders please message me for a special invoice to include shipping to your country]﻿ NOTE: Series TWO is also available, same price as series one. If you wish to order Series Two instead of Series One just use this click/checkout and then message me that you want series two instead. If you want BOTH then order '2' of this and message me your order is for Series One and Two. 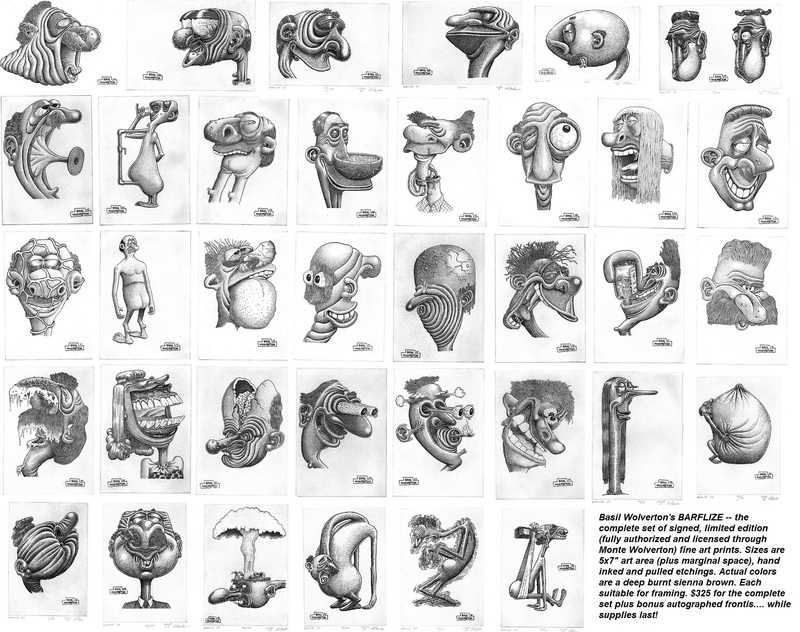 BASIL WOLVERTON ~ The Barflize Complete Limited Edition Fine Art Etching set with Monte Wolverton signed frontis etching. 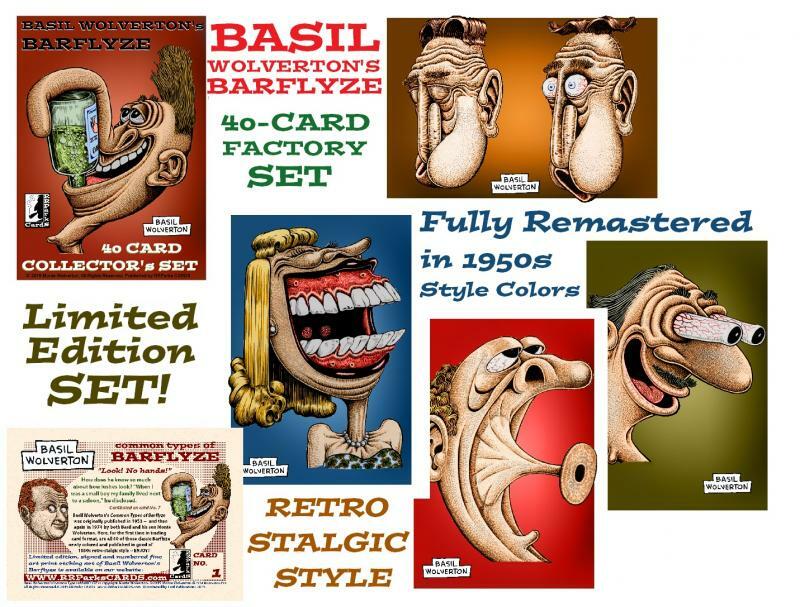 The complete, limited edition 40-card 'retro-stalgic' slipcased set of Basil Wolverton's 1950s COMMON TYPES OF BARFLYZE ~~ remastered in authentic 1950s pallette full color. [postpaid in the US, international orders please message me for a special invoice to include shipping to your country]﻿ NOTE: Basil Wolverton Series II: Wolverton Women is ALSO available! And for the same price, too! If you want Series II instead of Series I then just order series one and message me that you want series II instead. Easy as that! If you want BOTH ... Series I and Series II then just order this item quantity as "2" and let me know you want one of each. The '1959 Three Stooges Reissue' series is one of our most popular card series right now and I sometimes run out of stock (and more boxes have to be assembled) ... so I'm calling this item a 'back order' item. Those who back order are the first in line as more boxes are assembled and sealed. When back ordered the usual turn around time on shipping is about 7-10 working days. The $75 box price is guaranteed as long as my website shows $75. The price of this box will not be reduced in the future and when it is sold out this listed item will be removed from my website. THREE STOOGES THEATER Trading Cards Box with FULL METAL BOX TOPPER! 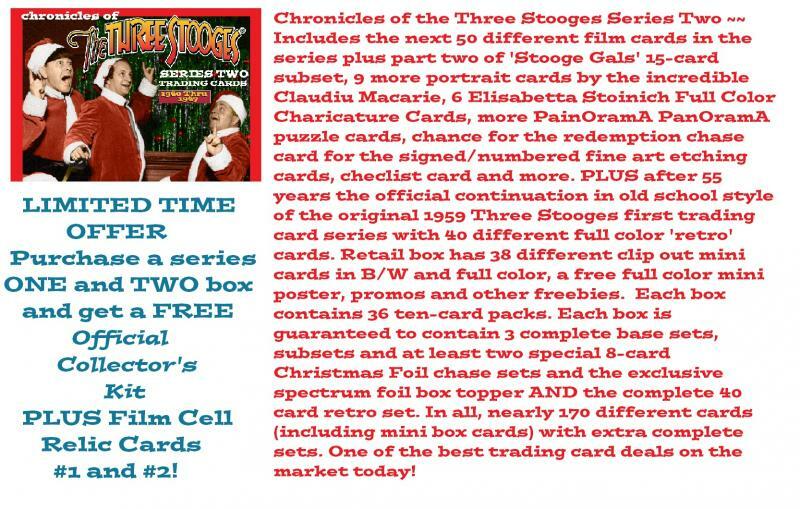 The Three Stooges Theater Trading Card series is the SEVENTH RRParksCARDS Three Stooges trading card series. This box comes with 24 10-card packs plus a special silver metal box topper. 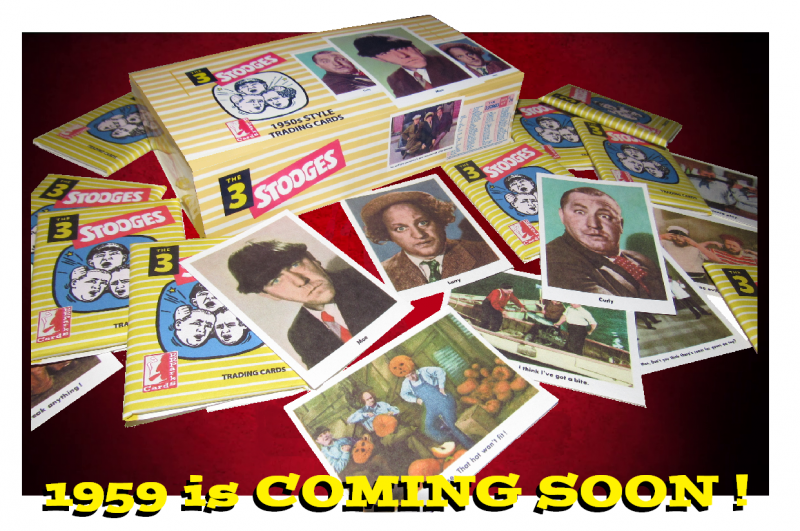 Inside the packs you'll be able to open and build a COMPLETE 106 card base set AND a special 'retro-stalgic' 1950s style subset which continues the Chronicles of the Three Stooges '1959 Continuation Series'. 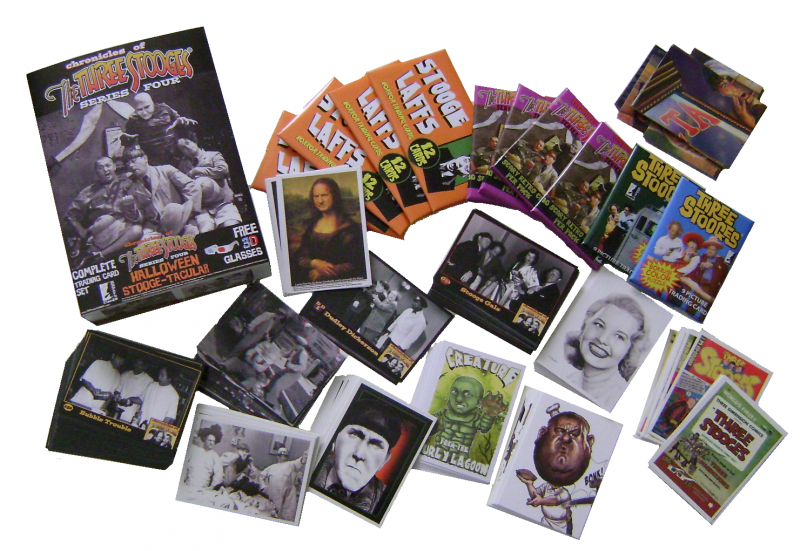 PLUS you'll find 4 'Faux Scratch n Sniff' Three Stooges cards and other goodies. This box is a VERY limited production box -- only 250 boxes were published and supplies are VERY limited. So this offer will stay on my website ONLY as long as it is available... the second you don't see if listed here that means they are completely sold out. Offer available to US mailing addresses only. Limit of one request per household per month. Offer valid while supplies last. If you wish to be notified of future projects and offers exclusive only to our email list customers include your email address with your self addressed stamped envelope. Your email address is confidential and will not be shared with anyone else. Happy to report that MST3K Series Two is created along with Sharknado Series One. MST3K Series Three is already in the initial stages of creation and will be HUGE! Hugely huge ... BIG even! And the initial artwork for the limited edition portrait art cards for Sharknado Series Two are underway. Aaron Laurich,Achilleas Kokkinakis,Adam Beck,Andy Moore,Ariel Mamani,Brent Scotchmer,Brian Abston,Caleb King,Carlos Cabaleiro,Christian Baster,Daniel Gorman,Danny Hayman,Darrin Pepe,Dave Gaskin,David Day,Eric Lehtonen,Gary Kezel,Ingrid Hardy,James Dickson,Jamie Hitchcock,Jason Crosby,Jeff Abar,Jenette Brown,Jerry Bennet,Jerry Garcia Jr,Jim O'Riley,Jon Arton,Jon Mangini,Juan Rosales,Kevin P. West,Kris Penix,Kristin Allen,Kyle Burles,Laura Atikinson,Laura Martin,Lee Brown,Louise Draper,Marsha Parkins,Matt Appelgate,Matt Stewart,Norvietro Basio,Rebecca Sharp,Rees Finaly,Rich Molinelli,Robert Floydman,Sammy Gomez,Scott Rorie,Tim Proctor,Tim Shay,Todd Smith,Tony Keaton,Trent Westbrook, Bujtor Klara and MANY more are being brought on (such as Leon Braojes, Mai Irving, Arturo Ramirez and others) Halloween 2018 series are also in the works (yes... STILL... as of January 2019 still working to get the 2018 Halloween series assembled and released. 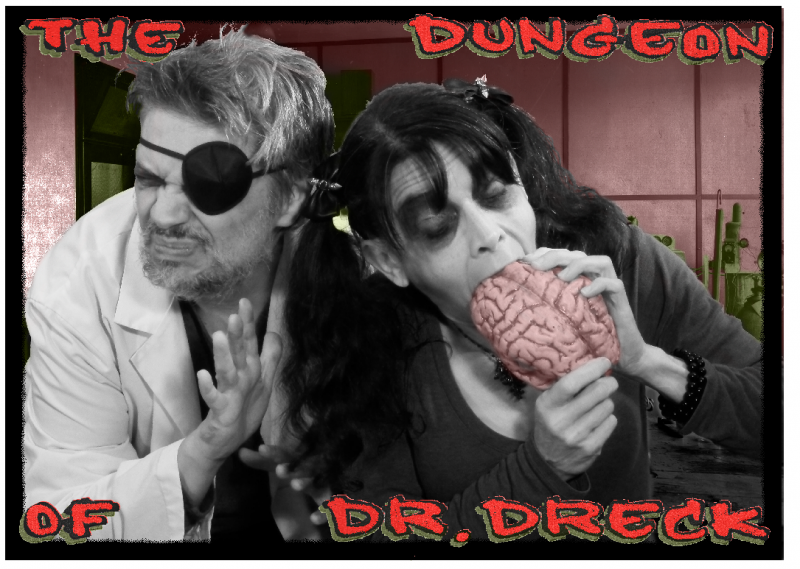 Due to the heavy workload of MST3K and Sharknado it is ridiculously LATE and will likely only be available to those who pledged on the Kickstarter ... at least until I have time to assemble more inventory and that might not be until next Halloween. So if you pledged on the Kickstarter you're fine and will get your sets soon. If you didn't pledge on the Kickstarter than might only be available October 2019 when the NEXT Halloween series are created and released). As Always, your emails are appreciated and am always here to answer questions (unless I'm just not HERE to answer questions... but I usually am). EACH PURCHASE OF ANY OF THE ABOVE CARD SETS COMES WITH BONUS FREEBIE PROMO CARDS (THE MORE CARD SETS YOU PURCHASE THE MORE FREEBIE BONUS STUFF YOU GET IN YOUR PACKAGE!). COMMENTS, QUESTIONS, SUGGESTIONS AND INQUIRIES ALWAYS WELCOME -- PLEASE USE THE 'CONTACT US' LINK ABOVE TO DROP US A NOTE. HAVE FUN WITH YOUR COLLECTION!